Thomas Newcomen's steam engine of 1712 was a great advance on Savery's earlier machine, although it was only used as a pumping engine. The piston (1) was forced up by steam pressure and the weight of the pump mechanism. A cold-water spray (2) condensed the steam, creating a vacuum which "sucked" the piston down. A boiler (3) provided steam and a tank(4), fed by a secondary pump (5), the cold water. Thomas Newcomen was a British inventor of the first practical steam engine. 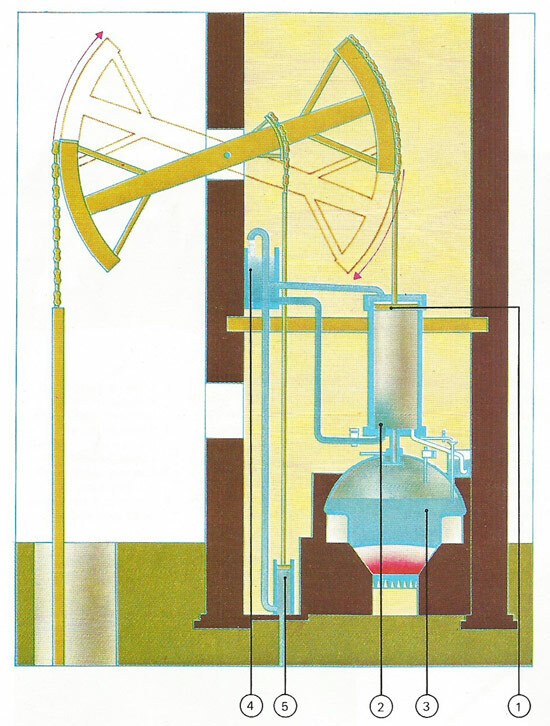 His device, employed mainly to pump water from mines, used steam pressure to raise the piston and, after condensation of the steam, atmospheric pressure to force it down again; it was thus called an "atmospheric" steam engine. Assisted by John Calley, a plumber, he spent more than 10 years perfecting the invention and in 1705 Newcomen built a model of the engine. A 1698 by Thomas Savery covered the principle, and Newcomen went into partnership with him. In 1712, Newcomen's engine began pumping water from a coal mine in Dudley, West Midlands, allowing the extraction of previously inaccessible coal. Once it became operational in September 1712, the design was quickly embraced by other mines. 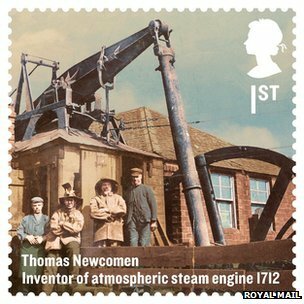 Newcomen's steam engine has been credited as being a key player in igniting the Industrial Revolution. An ironmonger all his life and a Baptist preacher, Newcomen was born in Dartmouth, Devon. By the time of his death, Newcomen and others had installed more than 100 of his engines, not only in the West Country and the Midlands but also in north Wales, near Newcastle and in Cumbria. Others were built elsewhere in Europe, including France, Belgium, Spain, and Hungary, also at Dannemora, Sweden. By 1725 the Newcomen engine was in common use in mining, particularly collieries. It held its place with little material change for the rest of the century.